HIGH Getting out of someone’s apartment just in the nick of time. LOW Hearing the loudspeaker spewing propaganda for, like, a straight hour. Whenever a totalitarian government reigns for an extended period of time, one of the questions that arises in the aftermath is how everyday citizens cooperated or turned a blind eye in the face of blatant injustices. I’m intrigued whenever a videogame attempts to rationalize that dilemma, such as when Papers, Please had me detaining immigrants with businesslike indifference. Hey, it’s either that or I lose, and I don’t buy games to lose. Beholder explores similar territory, moving the setting to an obvious stand-in for East Germany during the mid-‘80s and putting players in the role of Carl Stein, a landlord tasked by the state to spy on his tenants and report suspicious behavior. As sympathetic as we may be toward anyone battling communism, Carl has a family to care for, and negligence or outright defiance could put their lives (and his own) at risk. In gaming terms, angering the government means losing. 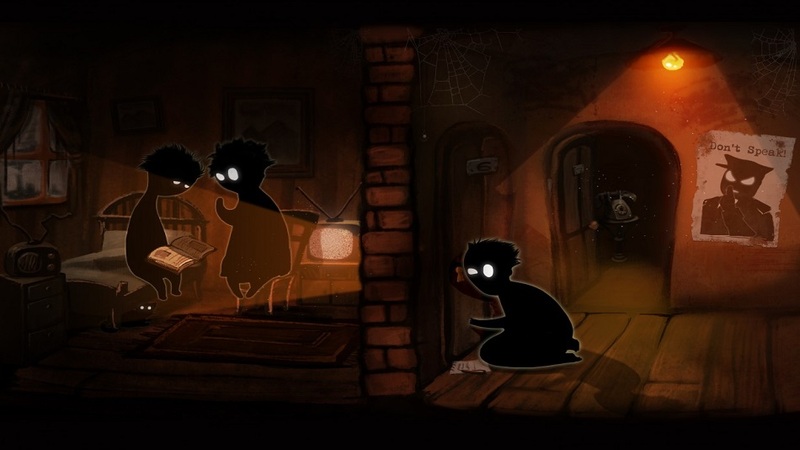 Beholder boasts a silly visual style that prevents the game from becoming oppressively bleak – the characters are represented as blobby silhouettes who speak in garbled gibberish – but don’t be fooled, as this is weighty material. There are several endings, and I can confirm that it is possible to get Carl’s entire family out of the country safely. That said, I didn’t manage it without framing, stealing, blackmailing, and murdering. I saved the lives of Carl’s loved ones, but ruined the lives of many others in the process. Using a simple point-and-click interface, players move Carl about the apartment building (displayed from a side-scrolling perspective to keep things manageable) to mingle with tenants, keep the utilities functional, and to snoop when no one’s looking. As the campaign goes on, the state passes new restrictions on various items and activities. Catching tenants in the act involves rooting through their belongings and installing hidden cameras in their apartments. Obviously, this can only be done when they’re out of the house, which in turn means monitoring people’s schedules, sneaking in once they’ve left, and finishing invasive tasks before they’ve returned. While successfully surveilling and reporting on tenants earns Carl both money and “authority points” which can be used for more persuasive dialog options, as the bills stack up, it becomes increasingly clear that a government salary alone isn’t going to keep the family happy and healthy. That’s when it becomes tempting to bend the rules – it’s possible to plant incriminating items in a person’s apartment or to blackmail guilty tenants into paying larger sums of money to avoid being evicted. There is a plot in Beholder beyond the need to keep Carl’s wife and children alive. An underground resistance is brewing, and key players from both sides of the conflict wind up in Carl’s building. When he’s forced to choose a side, the obvious choice is the resistance, as they can offer greater rewards and possible safe passage out of the country. However, their tasks also put Carl at risk of getting caught, and there’s a government inspection coming up. Further complicating things, one of Beholder’s first tenants is quickly revealed to be a double agent. How many more do they have? How much do they know about Carl? Amidst this mounting tension, Beholder’s greatest triumph is that it’s never overwhelming. The time limits are relatively generous, and Carl’s six apartments are easy to keep an eye on since the entire building can be viewed on a single screen. As the state tightens its grip and Carl is pulled into genuine life-or-death situations, I never felt that new parameters were being introduced too fast for me to adjust to them. Beholder is stressful on a moral level, but as a game, it’s simple and entertaining. I will say, however, that Beholder isn’t as replayable as developer Warm Lamp Games wants it to be. There are multiple endings, and it’s impressive how many conclusions each vignette can have – all of the player’s choices can have deep and lasting effects throughout each run. Having said that, the same characters and events basically crop up in the same order, which kills the suspense on subsequent playthroughs. A bit of random generation would have helped Beholder remain fresh for multiple runs. Also, on the playthrough that ended relatively well, one member of my family actually died but it never registered – everyone else kept talking about her like she was still around, and I earned the achievement for getting my entire family out unscathed. Not that I’m complaining, but I’m not going to risk treading back through the same content when a bug like that could dictate how Beholder concludes. Beholder’s biggest problem, however, is its translation. 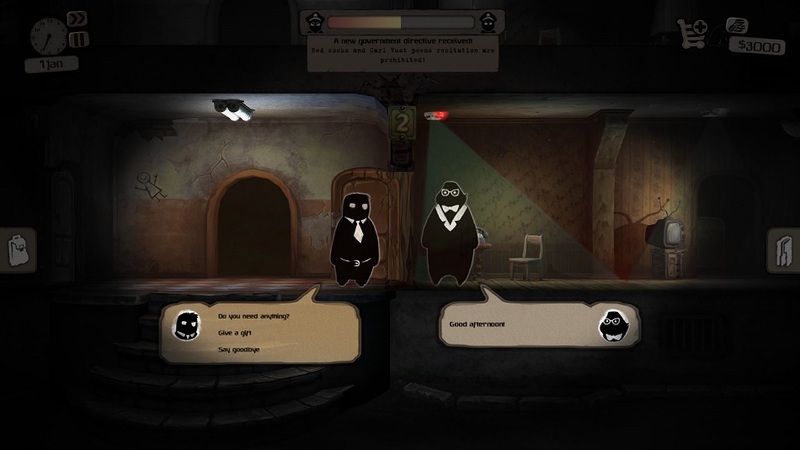 The dev team is Russian (writing what they know, apparently) and while it’s great that games from so many parts of the world are finding international audiences, the English dialogue in Beholder often borders on incoherent. It’s as if the script was filtered through Babelfish with zero regard for grammar or structure. In a game about gathering information, it’s crippling when said information is occasionally nonsense. Disclosures: This game is developed by Warm Lamp Games and published by Alawar Entertainment. It is currently available on PC. This copy of the game was obtained via publisher and reviewed on the PC. Approximately nine hours of play were devoted to the single-player mode, and the game was completed. There are no multiplayer modes. Parents: As of press time, this game has not been rated by the ESRB. There’s no explicit content and the cartoonish visual style prevents the game from being too disturbing, but it’s nevertheless full of heavy material: murder, suicide, invasion of privacy, and the need to perform morally questionable tasks under the command of an oppressive government. Deaf & Hard of Hearing Gamers: All important dialog is restricted to text and there’s plenty of visual feedback, though it can be a bit easy to miss important time-sensitive events without hearing musical and sound cues.